Arrestor Blocks, Spirit Levels, Rails Etc. Order before 1pm (Mon - Fri) for Same Day Dispatch* - Click here for delivery info. Please ensure these mounts will suit your application by carefully checking that the tube size and base type is correct before purchasing. Base Fitting: 9.5 - 11.5mm (3\8") Dovetails - Most popular size (suits most MODERN airguns & .22 rimfire rifles). Tube Size: To fit 30mm diameter body tube scopes. Front Lens Size: Up to 45mm - This figure describes the maximum size of the objective (front) lens the mount is designed for when the dovetails are flush with the barrel. Please bear in mind scopes with front PX adjustment will often need higher mounts. Bolt Type: Allen Key bolts - Allen Key(s) Supplied. Clamp Design: Double Clamp (four bolts on each cap). With removeable recoil stop pin. Accushot mounts are all superb quality with a no quibble lifetime warranty. Allen Key(s) and spare cap / base allen bolt. 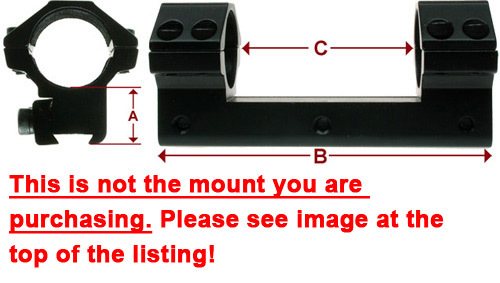 Image to show dimensions only - Please see the image(s) at the top of the page for the mount your purchasing. We will happily exchange or refund any item returned unused and unmarked within 14 days of delivery, all items have a 12 month warranty. Please note: We are 100% mail order only and have no public access. *We aim to despatch all orders received before 1 PM the same day (Mon - Fri - Excluding public holidays), delivery charges are based on the total order weight. The cost of delivery is displayed on the checkout page, delivery surcharges may apply to some remote areas - if your order is affected we will contact you.